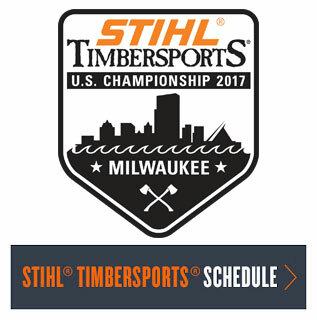 by Roger Phelps, Promotional Communications Manager, STIHL Inc. Recently, I had a chance to spend time with more than 800 of the best and brightest students in green industry fields during what some have called the “green industry olympics.” The NALP National Collegiate Landscape Competition (NCLC) is a four-day event that tests the skills of horticulture, arboriculture and landscape students across the U.S. These are the folks who, in a few short years, will be caring for American parks, forests, landscapes, and green spaces. This was the 36th year of the event, and students from more than 60 colleges and universities gathered together at host school Kansas State University to compete in events as diverse as small engine repair, plant identification, wood construction, skid steer operation and business management. Over 150 industry representatives from as far away as Alaska were also on hand at the Career Fair, where students interviewed and received job offers from some of the top landscape companies in the country. The reason that we have been supporting this event for over a decade as the lead sponsor is that we believe strongly in supporting these future caretakers of America’s green spaces. It is also the reason why we sponsored two FFA teams to attend the event. The teams from North Carolina and Kansas were the top finishers in the National FFA Nuresery and Landscaping Career Development Event. 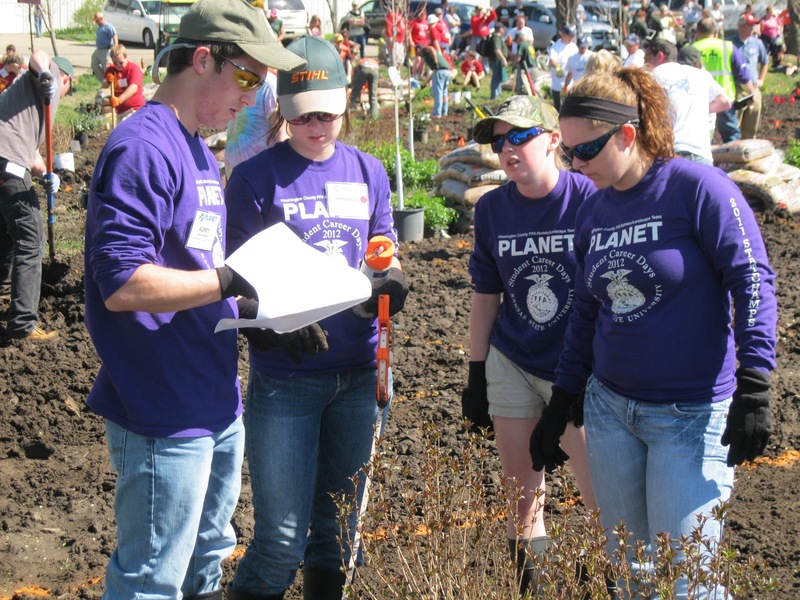 The eight students had a chance to interact with school and industry representatives and compete in four different college-level events, including the landscape plant installation. 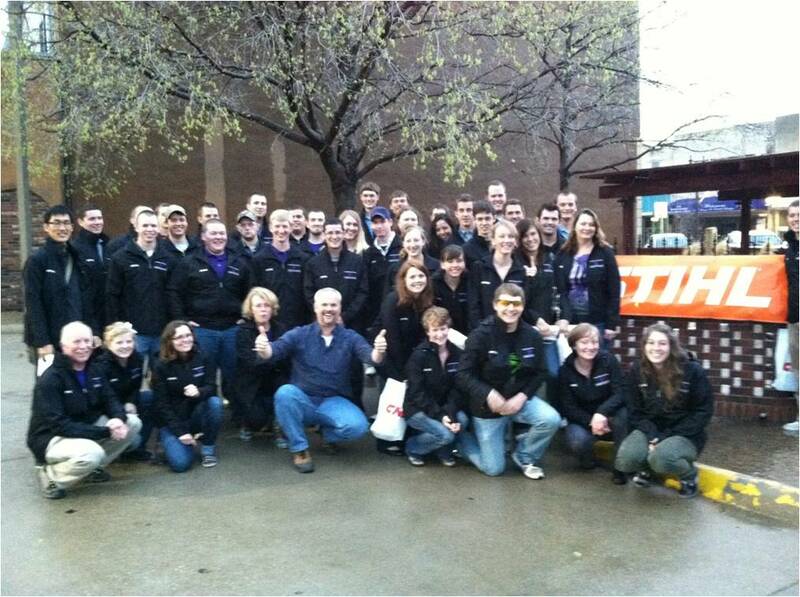 I think they all had a great time, and what was most rewarding for me was to see their excitement about the industry. Nothing like hanging out with the best in the business to get you excited about a future in this line of work we all love. An integral part of the NCLC is the NALP Foundation ceremony. Each year, the foundation awards scholarships to students pursuing a course of study in the green industry. This year, there were over 200 applications, and more than 60 scholarships and awards were presented, totaling more than $70,000, at the annual recognition reception. We are proud to be a founding sponsor of the foundation, and we have increased our commitment to $50,000 to join a select few as a Platinum Ambassador. Owens Community College: Each year we award the STIHL Spirit Award in honor of Walt Peeples. This award goes to the team that shows the most teamwork, camaraderie, fair play, and passion. According to our judges, Owens took an early lead and never looked back. They received a plaque and a check for $1,000 from STIHL. 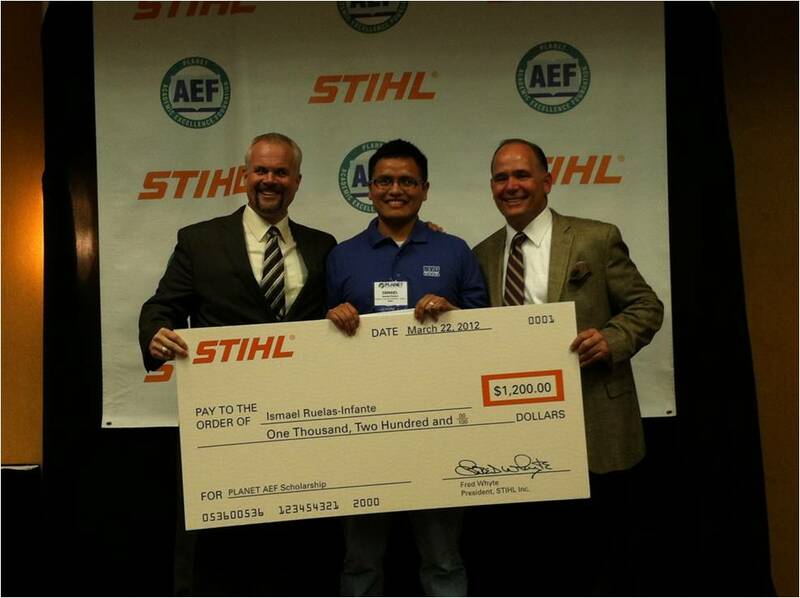 Ismael Ruelas of Brigham Young University – Idaho received the STIHL Landscape Scholarship in the amount of $1,200 during the PLANET AEF dinner. The scholarship is presented each year to a Hispanic student pursuing a course of study in landscaping. I had the honor of hosting this event and presenting the scholarship to Ismael. 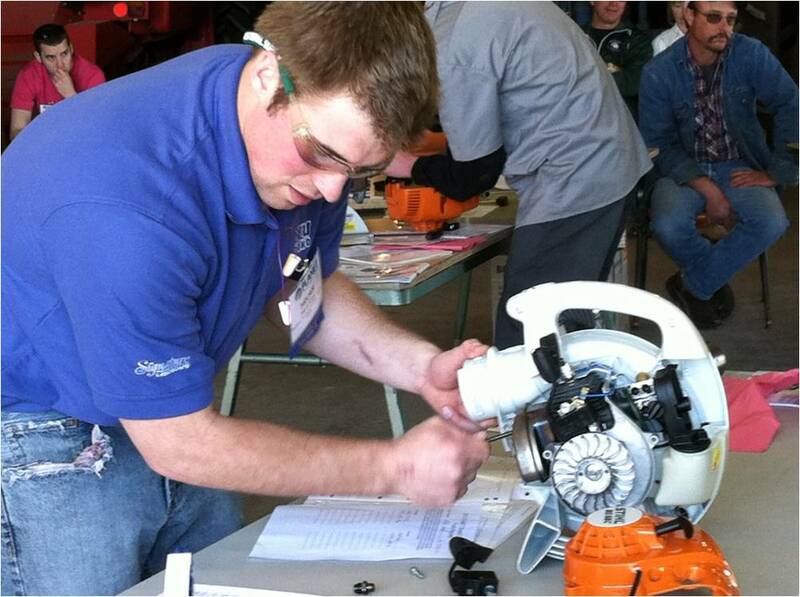 Joe Shear of Michigan State University took top honors in the small engine repair competition. The competition, which is designed and administered by Eddie Anderson. Eddie heads our STIHL MasterWrench Service™ training course. The contest consisted of a 100-question written exam, and a 2-hour timed practical exam using an engine from a STIHL blower. 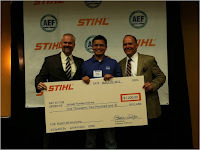 Joe received a $100 product certificate from STIHL and earned his school a $3,000 STIHL tool kit. Micah Wood and Jeff Monroe from Brigham Young University – Idaho bested 39 other teams in the wood construction event by building a top-quality park bench under timed conditions. They each received a $100 STIHL product certificate. I have been attending this event for nine years now, and seeing the caliber of the students who will be the caretakers of our green spaces has helped assure me that the future is in good hands. I encourage you to learn more about the wonderful work these students do at NCLC, and visit the NALP website to get involved or to support their efforts. I would ask that you also consider donating to the NALP Foundation to secure the future of our industry and our environment. 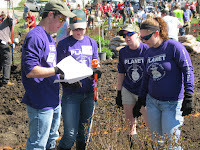 For more photos of the event, visit the 2012 NCLC gallery on the STIHL Facebook page.